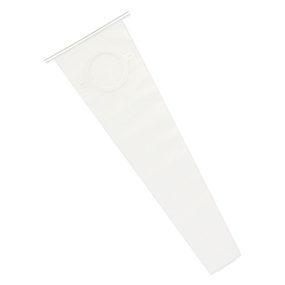 The irrigation sleeve is designed to be used when routine colostomy irrigation is recommended by a healthcare professional to regulate emptying the bowel at a scheduled time. The drain opens at the top for easy access to the stoma during the irrigation procedure and can be closed with the attached wire closure. The long sleeve allows effluent to be directed into the toilet. A belt is required to secure the sleeve to the body. Includes drainable pouch clamp.